Sinn Féin National Chairperson and MEP for Dublin Mary Lou McDonald has said not one person should be sleeping rough in Ireland while politicians and economists applaud themselves for the creation of the Celtic Tiger. 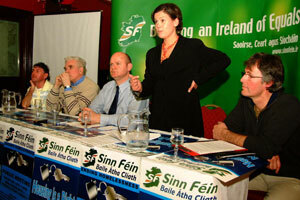 McDonald made her comments at a public meeting organised by Sinn Féin in Dublin on Thursday, 19 December last entitled Ending Homelessness. The meeting was also addressed by Fr. Peter McVerry of the Arrupe Society, Brendan Dowling of the Community Forum and Chris Meehan who was homeless for twenty-five years. “It is clear from listening to the stories told by previous speakers tonight that Homelessness is at crisis point here in Dublin City, where over 300 people spend every night on our streets. This is totally unacceptable especially at a time when many politicians and economists applaud themselves for the creation of the Celtic tiger. Despite their platitudes the reality for many is very different. It is apparent that much work still needs to be done to ensure our society becomes one based on inclusion. For the hundreds of homeless the Celtic tiger continues to remain a myth”, McDonald said. “Only last year a migrant worker in Coleraine was forced to sleep rough and had to have both her legs amputated as a result and we also saw a series of deaths among the Homeless community here in Dublin. Not one person should be forced to sleep rough in the Ireland of today given the resources at our disposal at a time of unprecedented wealth. “According to the official Government count, over 300 people are sleeping rough in the Dublin area. But this is just the tip of the iceberg. The ‘invisible’ homeless, people who live in emergency accommodation: in shelters, hostels, refuges, in B&Bs or double share with friends and relatives, make up about ten times the number of people sleeping rough. They are also in need and equally without a home. Almost 3,000 adults are homeless in the Greater Dublin Area”, the MEP said. “Sinn Féin regards the delivery of sufficient levels of appropriate social housing as key to the resolution of the homelessness crisis. This current government needs to act – it needs to deliver that which the market is unable or unwilling to deliver. A first step in this would be to properly implement Part V of the Planning and Development Act 2000 to ensure the delivery of twenty percent social and affordable housing in all new developments. However the government has amended this part of the Act at the behest of developers to give them a buy-out clause. “Ending homelessness is not an impossible goal — the money is there and with real political will we could eradicate homelessness in this state. However, unfortunately, this government lacks that political will. Sinn Féin has the political will to work towards Ending Homelessness, our party brought forward a Bill in Leinster House to insert a Constitutional Right to Housing in the Irish Constitution. We will continue to work with Community organizations and Campaign groups to ensure this is a priority for all political parties in the next Election”, said McDonald.